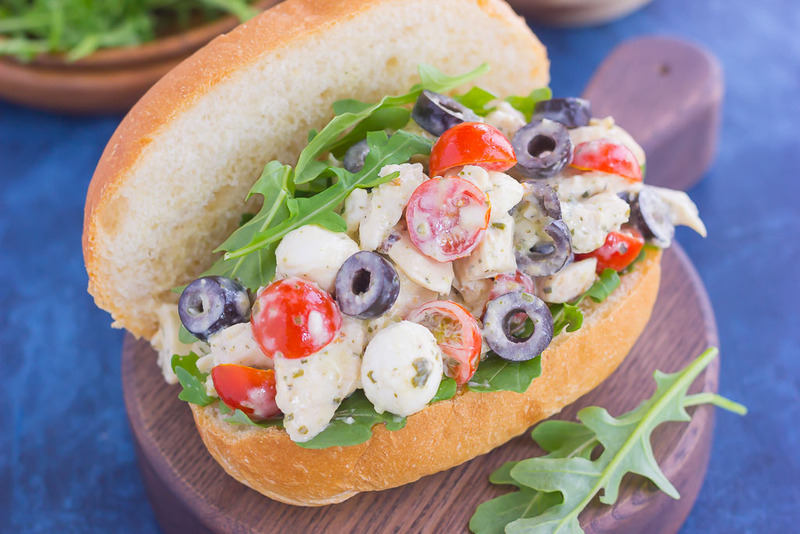 This Italian Chicken Salad is fresh, easy, and bursting with flavor. Loaded with mozzarella cheese, tomatoes, black olives and pesto, this fun twist on a classic flavor will have you coming back for more. This salad is perfect for an easy lunch or dinner and makes delicious sandwiches, too! I couldn’t let the summer go by without sharing another salad recipe, could I? Or maybe, just maybe, you’re like me, and you could eat salads just about every day, and then some! I’m hoping you’re in the latter category, because I could definitely eat salads just about every week. And when it involves fresh flavors, veggies, and protein? Even better! 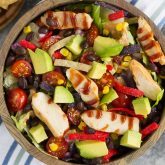 But instead of sharing another boring ‘ole chicken salad recipe, I jazzed it up for you, friends! 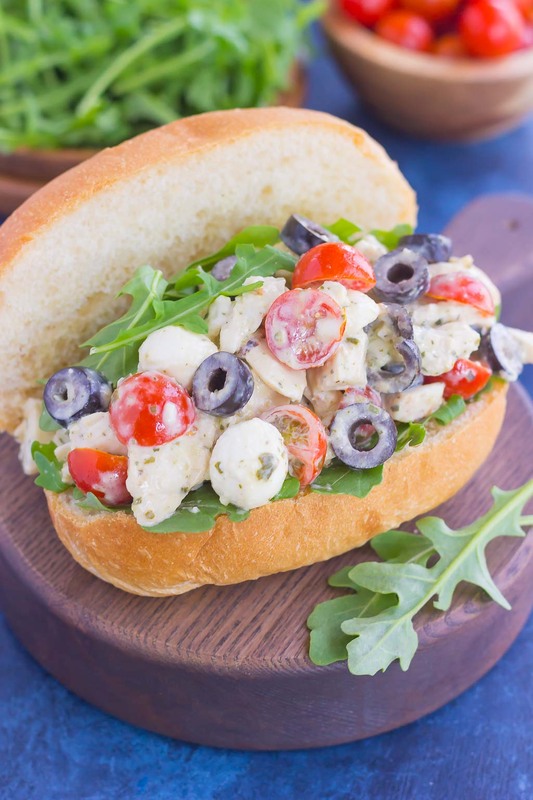 This Italian Chicken Salad is anything but boring, and is bursting with all of that summer goodness. And it makes the perfect 30 Minute Thursday meal! It’s ready in just about 10 minutes, with no oven required! See? I told you this Italian Chicken Salad will take the classic dish to the next level. No plain stuff here! And, truth be told, I’m not a big fan of regular chicken salad, which is why I love to mix it up! 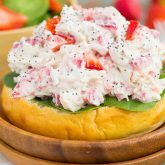 Remember this Strawberry Poppy Seed Chicken Salad and that Lightened Up Zesty Chicken Salad? The plain version, with miracle whip, celery, etc. is just not for me. But, throw in some zesty Italian flavors, and I’m all in! First, the pesto…mmm mmm good! It makes the most delicious combination when paired with a touch of mayonnaise. And then there’s the olives. Oh, black olives, how I love thee! Add in some fresh mozzarella balls, cherry tomatoes, and shredded rotisserie chicken. Mmm mmm good! And easy! So easy, guys! But, you knew that was coming, right? 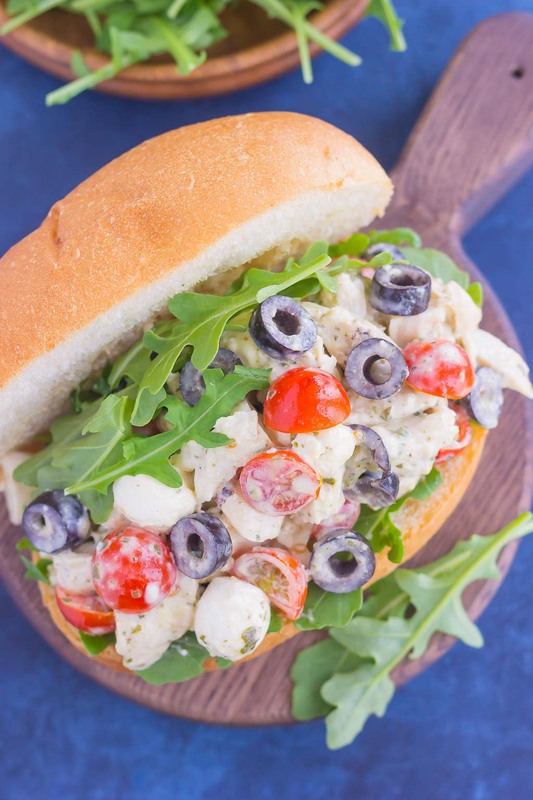 This Italian Chicken Salad takes just minutes to whip up, especially if you use the store bought shredded rotisserie chicken (it’s one of my secret, time saver ingredients that I use in a lot of my meals). It’s fast, fresh, and perfect for when you don’t want to turn on the oven or stove. 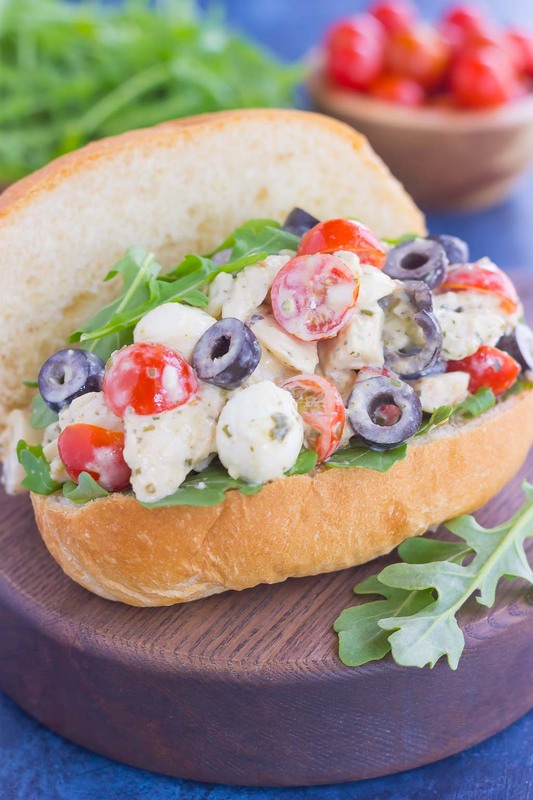 So, if you’re in need of an easy meal or dish for your next outing, this Italian Chicken Salad is it! You’ll love the zesty flavors an ease of this summer salad! 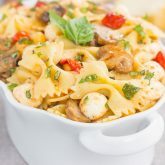 In a large bowl, combine the chicken, mozzarella pearls, black olives, and cherry tomatoes. Set aside. In a small bowl, whisk the mayonnaise, pesto, and salt. Add to the chicken mixture and toss to coat. Serve immediately on sub rolls, if desired. I'm never overwhelmed with salads. Lol. I could just eat them all day long. Love the pesto in here. Looks like a great late Summer meal! We are definitely cut from the same cloth, Gayle, because I am a salad all day every day type of chic. Needless to say, I am LOVING this Italian Chicken Salad!! 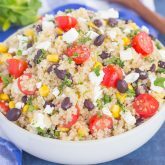 I am swooning over the little mozzarella pearls in here, and the hubs is an olive freak so I see this salad being a huge hit over here at the SuBourbon Country Cottage! Can't wait to make this! Pinned of course! Cheers, friend! Anything with pesto gets my vote! I could eat it everyday! Love this sandwich - and the fact that you made it using rotisserie chicken is very appealing! Pinned! Thanks, Annie! Pesto is a game changer! I could never tire of salads and could definitely eat every.single.day too....especially when it looks as good as this!! There is literally not one thing in this that I don't like and it comes together super fast, which is definitely always a bonus :) All I need is a coffee and I'm set! Pinned! Have a wonderful weekend! I'm a huge salad lover (in any variety), and this is totally calling my name. I can never have enough of the veggies, the textures, and the flavors! Salads are all I want to eat right now...it's just too hot! 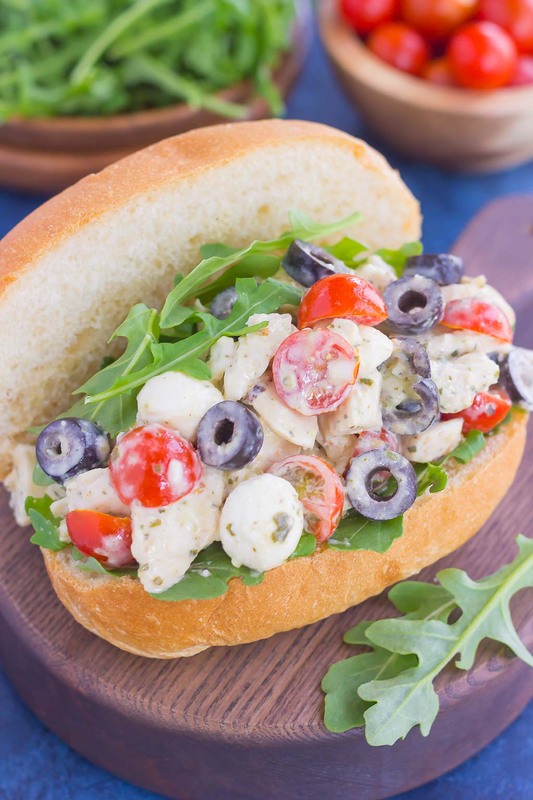 I love this Italian twist on chicken salad Gayle. All of these ingredients are my favorites, especially those mozzarella balls! This is such a quick easy dinner and the leftovers would be perfect for lunch! Thank you, Marcie! I love easy dinners that serve for leftover lunches! Love salads like this one! Such a great combination, with an Italian twist! Pinning! This sounds fantastic!! I love the addition of olives for that nice salty punch. Beautiful presentation too in your photos. This looks really, really delicious that this made me crave for chicken salad. Will definitely make one tomorrow. For now, let me dream about it while sleeping hungry. Haha! Thanks, Sheila! It's a favorite of mine. Hope you like it if you try it!